M&A Tax Associate, KPMG – beginning July 8, 2019. A full range of other services including earnings and profits analysis, stock basis studies transaction and bankruptcy cost analyses, and income tax provision advisory services. I believe there are three approaches to empowering women. First, on an individual-micro level; second, on a community level; and third, on a global-macro level. The combination of all of the above not only contributes to the development of women but also the advancement of humanity as a result of increased and active participation of women. 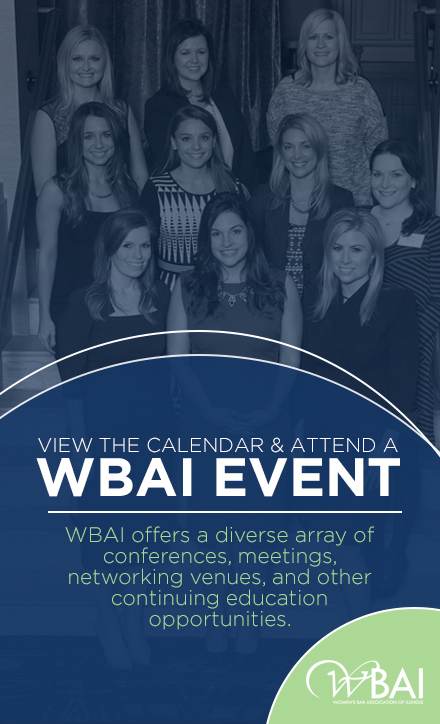 This methodology is evident in how the WBAI actively empowers Women in Law. With the creation of the Women’s Well-Being committee, our members have the opportunity to seek empowerment on a micro-level. As part of their mission, the Well-Being committee plans to address social, emotional, occupational, intellectual, physical and spiritual well-being. The annual recognition of Top Women Lawyers in Leadership and the annual golf outing goes a long way to introduce our members to the legal community and to each other. Last but not least, the WBAI has also shown its commitment to engaging on macro issues when members represented at the 2017 and 2018 March to the Polls. On a personal level, I empower myself by actively participating in the community. I learn from every action, inaction, and interaction with the world around me. I joined the WBAI in 2015, during my final year of law school. It was also the first year I joined the Annual Installation Dinner Committee, to assist with the planning of WBAI’s largest event of the year. Today, three years later, I have the privilege of Co-Chairing this very event and I am honored to be trusted with the responsibility. Additionally, being new to the Chicago legal market, I wanted to join a community that supports one another in significant and relevant ways. It was important to me to connect with a group of individuals with shared experiences to engage in discussion and seek advice without judgement. At the risk of repeating myself, I strongly believe that one of the best ways to empower women in law is to participate in both the legal and generally community and being a member of the WBAI allows me to do that effectively. Professionally, I am looking forward to a positive start to my new career as a Tax Associate. Personally, I am looking forward to a very active year with the WBAI, some travel, family time and a lot of cuddles with my fur babies. As a result of my father’s profession as a marine engineer, I spent the better part of my childhood on various commercial cargo ships living with people of various nationalities and visiting a multitude of countries on six continents. I was fortunate enough to survive a large marine accident on the Atlantic and continue to embrace my love of travel. I am also a huge proponent of the ethical treatment of animals. I do not visit zoos or aquariums. I do not ride animals. I do not purchase leather, down, wool, pearls, fur or silk. I make an effort to research any products I purchase to ensure they have not been made from or tested on animals. I am still working on changing my diet which is proving to be much more difficult that anything I have done before.